First 2013 showers in Sindh? The year 2013 has started with severe cold wave in the northern areas, the chilly winds were strong enough to reduce the temperature to freezing level in the plain areas of Punjab. After 50 years the temperature of Murree and north-eastern Punjab (Faisalabad and Sahiwal) was same that is -2°C on January 8 while Lahore froze at 0 °C. Since January 10, western disturbance ’14′ has caused the temperatures to slightly increase while the fog conditions have subsided with the entrance of a weather system. But this is all about to change as an active rainy pattern is likely to take over the country. Proper activity of 2013 winter coming? A cold wave could grip the country on January 17/January 18 till onwards but its intensity would be weaker than the cold wave experienced by the country especially Punjab, Azad Kashmir and Khyber Pakhtunkhwa few days back. Western disturbance ’15’ is moving towards the northern-western areas of the country from Iran and adjoining Afghanistan. WD ’15’ is marching towards the north-western areas of the country and would reach on January 14 night/January 15. Intensity of western disturbance ’15’ seems moderate at the moment. According to charts and graphs, it is likely to weaken slightly, it would stay in Pakistani territory till January 19 morning. Northern areas – Some heavy downpour coming! Western system ’15’ could be responsible for some locally heavy downpour during this week. 50 mm to 65 mm precipitation could fall from January 16 till January 19 morning in the areas of Muree (Punjab), Muzaffarabad (Azad Kashmir), Kalam (Khyber-Pakhtunkhwa), Besham Naran (Khyber-Pakhtunkhwa), Dasu (Khyber-Pakhtunkhwa), Saidu (Khyber Paktunkhwa), Kagan (Khyber Paktunkhwa) and Mardarn (Khyber Paktunkhwa)and other adjoining areas. During this period, rainfall below 50 mm rainfall could fall in capital city of Islamabad with thunder/lightning and fast winds (50 km/h to 56 km/h). While in Punjab especially north-eastern parts that are Sialkot, Jhelum, Gujrat, Gujranwala and Lahore – there could be rainfall with thunder/lightning along with fast winds. Rainfall to remain below 45 mm here as per latest analysis. 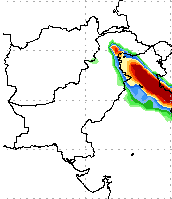 The most heaviest precipitation could occur in Jammu and Kashmir. South Punjab that is Multan, Bahawalpur and adjoining cities may experience a drizzle/isolated shower that would remain below 15 to 20 mm on January 17/January 18. Southern areas – Karachi too get wet? Western disturbance ’15’ may cause a coastal thunderstorm to form near Sindh-Makran coast on January 15 due to a presence of a pressure of low area developing on January 14. This thunderstorm may not be strong and could give Karachi a drizzle/isolated shower of 1 mm to 5 mm on January 15 night/January 16. Second Winter showers coming then? looks yes at the moment! There are chances of drizzle/isolated shower in other areas of Sindh that is western and upper parts (Dadu, Hyderabad, Thatta, Nawabshah, Sukkur, Larkana and other surrounding cities) on January 16/January 17. The activity in Sindh is very weak. Slight possibility of drizzle/isolated shower in Karachi on January 15/January 16 while upper parts of Sindh may get some drizzle on January 16/January 17. Fresh Western system ’15’ coming towards northern areas on January 15, rain with thunder/lightning along with fast winds may occur from the middle of this week in Islamabad, Lahore, Faisalabad, Gujranwala, Peshawar and other surrounding cities while possibility of heavy precipitation in Azad Kashmir and surrounding Khyber Pakhtunkhwa. ← 50 years after: Murree chill came to Faisalabad!! Is there any possibility of strong western disturbance to grip most parts of the country and to stay for 3 to 4 days? Actually this WD could affect the country till five days that is from tonight till January 19. 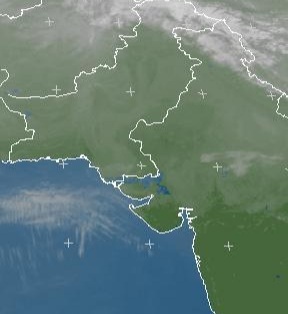 Tonight, it could cause drizzle in Karachi and north Balochistan, Sindh coast and from tomorrow evening/night, it could affect the northern areas. However the intensity is moderate at the moment. Wd 15 couldnot cause any rainfall in risaplur Khyber pakhtunkhwa. Even there was no cloud cover. Is there good rainfall expected in risalpur in the remaining days of january? There must have been a cloud cover however now the WD is moving and another wd could affect the northern parts after some days in jan..
it did in the morning..
Are the winters are gone…. ?? Hello bhai. will the rest of January go dry….. ? You were right. Today it is cold and cloudy. will you issue weather update for Feb 2013 ? I might issue the second Winter outlook tomorrow, in which i might add some weather update.